Discover important insights and act on them instantly with the Power BI data driven alerts now available on iOS, Windows 10 mobile, and soon Android. If you are an iOS user, you are probably familiar with the ability to set a data driven alert on your device and getting a real time notification once the data exceeded the limits you have set. 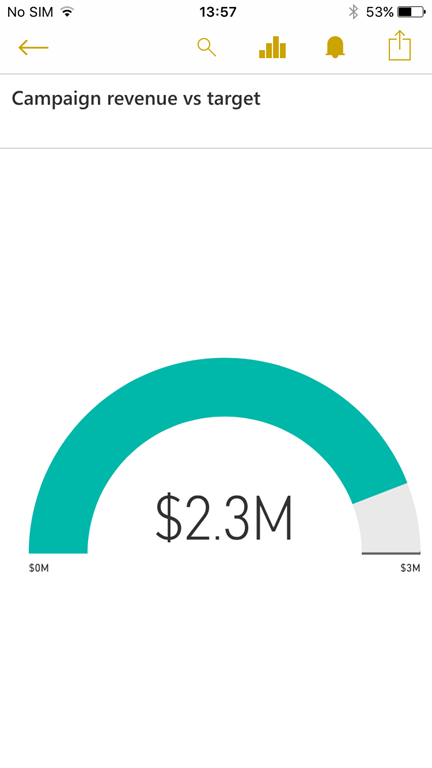 With this release of Power BI Mobile, we've enriched the data alert experience and brought it to all platforms. 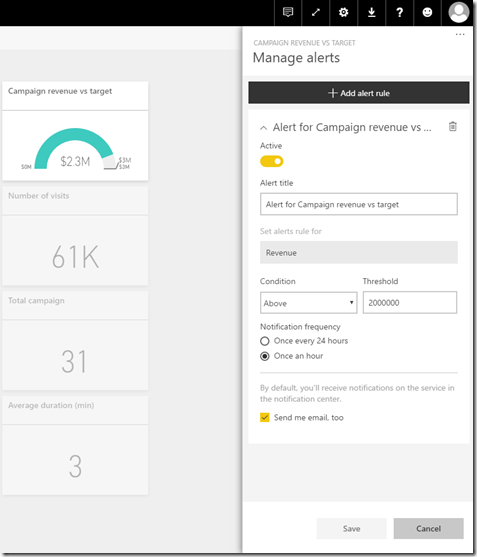 You can set an alert directly from the Power BI service, or through the Power BI mobile app. Yes, you read it right: data driven alerts are available on iOS and Windows 10 mobile, and also very soon on Android! Set alerts for your most important metrics, and you'll always keep a close eye on them. You can set alerts on Gauges, or Card tiles. Alerts are now fully synchronized across all platforms, so no matter where you choose to set your alert it will be reflected on both mobile and web. 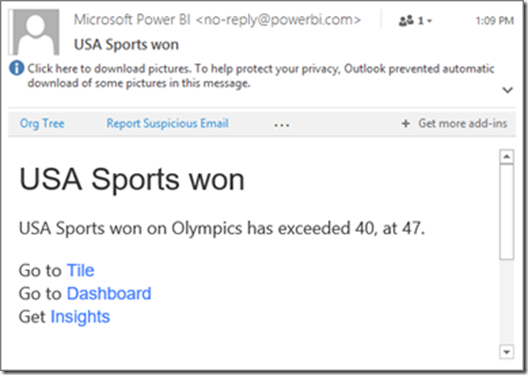 Only you can see the data alerts you set, even if you share a dashboard or a snapshot of a tile. Alerts are now more personal. You can customize an alert's title so you can easily recognize it, and control its frequency. Alerts will be triggered only if the data is refreshed and the selected metric crossed the set limit. You can choose to receive notifications once an hour, or once a day. You can even choose to be notified by email. There is no limit on the number of alerts you can set. When the alert is triggered, you will receive a push notification to your mobile device according to the frequency you have chosen. In addition to the push notification, you can always use the notification center on any platform to review previous triggered alerts. You just received an alert that a metric has crossed your set threshold, but now what? Each alert is also a direct link to your data, and clicking on the notification will take you directly to the relevant tile where you can explore and learn more. If you want to share this tile with a colleague, you can use the annotate and share feature on Power BI Mobile to continue the discussion. If you've set up the alert to send you an email, you'll find something like the following in your Inbox. 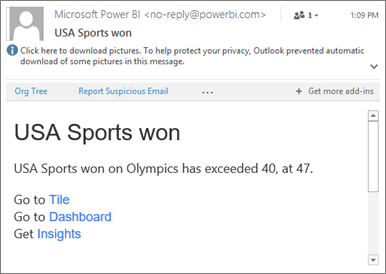 This mail contains direct links to the alert tile and dashboard, and even a quick way to get more insights on this tile. Alerts has been one of our top requested features, and we're very excited to have it in this most recent release. As always, let us know what you think in the Power BI community.